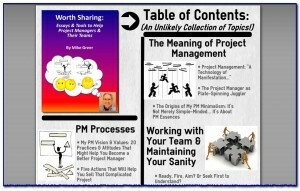 The new book is an eclectic compilation of practical PM tools, thought-provoking PM essays and suggestions for helping individual project managers and their teams stay sane while delivering quality finished products. Over 300 pages, it consists of 54 Chapters and hundreds of live links to additional PM resources.Most of the chapters were originally published as blog posts and have never before been released in book form. A few chapters include some important, classic excerpts from my previous books. 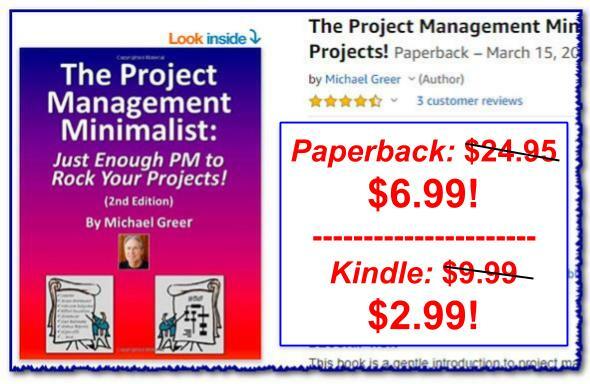 Part 1 contains three chapters focusing on what Project Management (PM) has come to mean to me after having written several PM books and spent decades practicing PM and teaching PM workshops for PM newbies. Check out this PDF/Infographic of the entire Table of Contents! This Part contains a dozen chapters focusing on specific perspectives, strategies and tools that project managers or team members can use to better manage their projects and their team relationships. 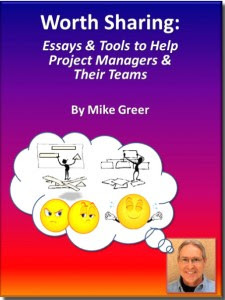 This Part includes a dozen chapters dealing with some of the interpersonal “people stuff” that makes working with project teams so challenging. It includes “war stories” and specific strategies that might help the project manager and the team work together more effectively, get better results and feel good about participating on any project. This Part includes a dozen chapters that examine my favorite perspectives and specific techniques that can lead you to a more peaceful state of mind. This Part is based on the following assumptions: If you’re all crazy and agitated, you’ll likely transmit this insanity to the rest of your project team. And worse, your work-related agitation is likely to follow you home, generally screwing up your personal life. On the other hand, if you can acquire a centered, peaceful state of mind, there’s a good chance you can help to calm things down on your project when things start to get tense. This Part includes seven chapters which examine the broader organizational context of PM (project management) and suggests ways that would-be PM leaders might clarify their PM vision and create a better organizational climate for PM. This Part includes eight chapters that leverage my several decades of experience in performance analysis, instructional/curriculum design and PM (project management) training. While some of the articles are directed to PM trainers and HR people, others speak directly to the PM newbie who is looking to get started on a career as a project manager or team leader. Read it ALL online for free! Amazon/Kindle*, Barnes & Noble/NOOK*, Kobo/epub/iOS version* or Amazon’s createspace (hard-copy/paperback)**. * Apple users: You can download free apps from the iTunes store to read Kindle, NOOK and Kobo e-books on your iPad®, iPhone® or iPod Touch®. ** Good for you!! You followed the double asterisk to the bottom of this blog post…. Ding, ding, ding, ding!!! You win a special discount code for the paperback! !Enter R62MFPWY at checkout and get $10 off the CreateSpace hard-copy/paperback version! Whoo hoo!! — Cesar Abeid, PMP, is Author of Project Management for You and host of the Project Management for the Masses Podcast.